Have you seen books or articles about asking God to help you find the perfect word for the new year? 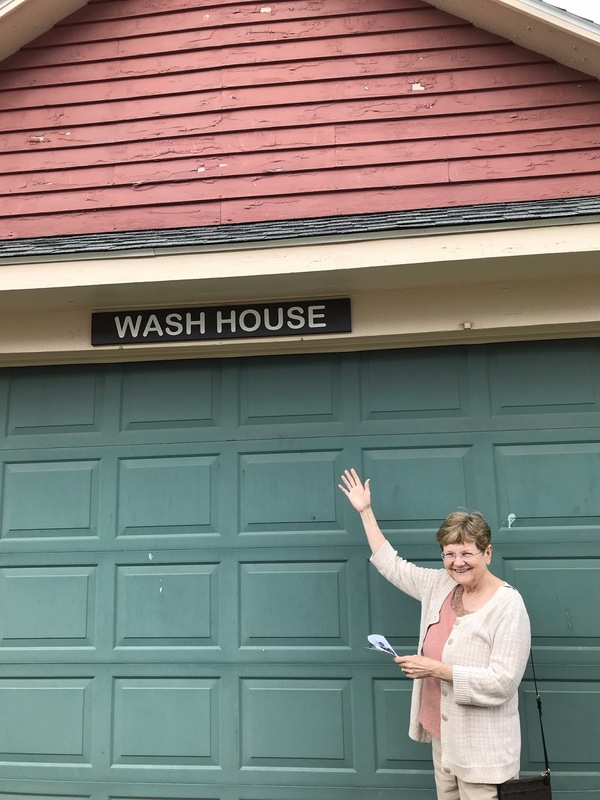 This past year my words found me through the research and Bible verses I used for the theme of my latest historical novella, Pressing On, published by Barbour Publishing in The Erie Canal Brides Collection. People of the early nineteenth century certainly had to “press on” and persevere! A couple of years ago I read an interesting article in a secular magazine about building the canal system in the American Midwest, so I suggested a book about romance along the canals to Rebecca Germany of Barbour. She liked the idea and asked me to get together with my agent, Tamela Hancock Murray, to form a group of writers to set seven stories along the Erie Canal and parts of Ohio. She also mentioned she would love one of the stories to be set near Zoar, Ohio, where the Separatists settled. So I decided to anchor my story there. 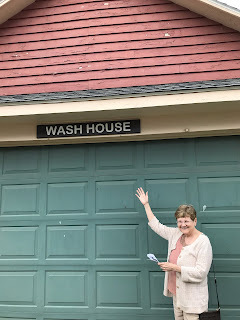 At the wash house in Zoar, where my heroine Amanda spent lots of time! If you went to school in the 1950s and 1960s like I did, you may remember the song lyrics “I’ve got a mule, and her name is Sal…Fifteen miles on the Erie Canal.” This was what most canal boat captains could cover in a day on the water. Canals were built in many locations across the United States as a cheaper, faster means of moving goods from one place to another. 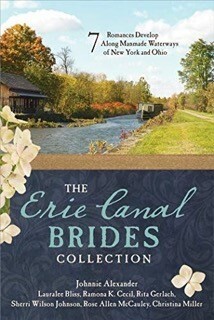 The Erie Canal was built near Lake Erie in the state of New York. The building of this canal “from Albany to Buffalo” began in 1817 and finished in 1825, which was very fast considering it covered 363 miles and took literally tons of back-breaking labor, much of it by hand. Today I want to tell you about a group of people I had never heard of before starting my research for this collection. The German Separatists who settled in Zoar, Ohio, fled the kingdom of Württemberg in southwestern Germany due to religious persecution. Their core beliefs included dedication to a life of moderation and fervent expectation of our Lord’s soon return. They disagreed with the state church over issues such as sacraments and holidays, and they faced imprisonment and the seizure of their property for refusing military service. The Quakers in America heard about their plight and offered to pay their ship passage from the Old World to the New, and even loaned them money to buy the land in Ohio. They named their new settlement after the Biblical city of Zoar, where Lot landed after he fled Sodom. When the Separatists came over from Germany, their leaders proposed having everything in common, and the people agreed. In some ways they remind me of the Shakers. In order to pay off their loan from the Quakers, the Zoar Seperatists contracted to build the canal through their land. They went through a period of years while the canals were being built where the men and women lived in separate housing and were forbidden to marry so the women could labor alongside the men to speed the process. Some of the women developed bald patches on their heads from carrying dirt in heavy baskets. When they were again allowed to marry within the group, they still had everything in common and still were controlled by the trustees. For their work, they were given food and shelter, although many had to share homes. The group formed in 1819 and disbanded in 1898 so the movement lasted less than eighty years. The original Separatists emphasized kindness and giving, but they also had strict rules and had to follow the trustees. As they went through the Civil War and as the town built a hotel, people saw how others lived with more freedom and in charge of their own money. The younger people voted to sell the property and divide up the money and land. My husband and I traveled to Zoar last year so I could see it for myself and do more research. Descendants of the Separatists still live in Zoar, and we met several of them on our trip. Like their predecessors, they struck me as kind and giving people. On a side note, a few years ago, a friend asked me to go to Amish country in Ohio with her, and we rode on a canal boat pulled by a horse. We think this was near Coshocton, Ohio. I remember it as a ride that was peaceful and quiet, similar to Zoar. There is also the village of Roscoe nearby, off Highway 83, which is also quaint and quiet. As a child, Amanda Mack loved her life in Zoar, Ohio, where she was born to Separatists who had helped build the canal. Now an adult (1857), she starts to chafe at its many restrictions. After meeting riverboat captain Daniel Jeremiah, they both must make decisions about their futures. Would she give up the way of life she grew up loving? Hi Connie, although I have written several historical novellas, this is my first appearance on HHH but I hope not my last. And a big thanks to Linda Thompson for sharing her spot with me this month! I love all of her posts, too, both historical and prophetic!